decades over the weekend by offering free rides, accommodation and meals. policy-making process.Ye Teng and her husband arrived at Beijing Capital International Airport at 3 am on Sunday only to find that there were no taxis and the Airport Express was closed down due to the rainstorm. The couple were among 80,000 passengers held up at the airport, but private cars driven by volunteers who answered calls on the Internet and lined up outside the airport finally got them home. to passengers on Weibo, China's most popular microblogging site. to have the same idea," Wang Lu told the Global Times. From 0:30 to 5:30 am on Sunday, over 300 cars from different districts in Beijing drove to the airport, an anonymous traffic police officer working at the airport told the Global Times. kindness of Beijingers. "I might have had to stay at the airport all night without the volunteer drivers." More people joined the team offering help on Weibo. 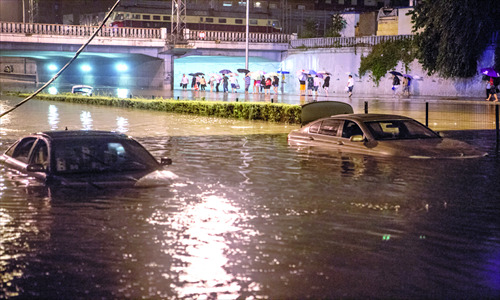 Zhu Guofan, a private entrepreneur, announced on Weibo that his company was offering rooms and refreshments free to people stuck in the rain. Wang Xiaoyu, a professor at Tongji University in Shanghai, told the Global Times that many relatively well-educated people who often keep an eye on social network sites such as Weibo tend to be more active in social work and more capable of helping others. rainstorm offered an opportunity for people to show their care and love," Wang Xiaoyu added. He Yongqiang, who works in a non-governmental organization, said in his Sina Weibo that the deeds of volunteers who lent a helping hand to others in the rainstorm showcased the feature of a civil society. obligations of citizens has been taking shape. However, while many people offered to lend a helping hand, some took advantage of the rain. Some cabs around Sanyuan bridge, Chaoyang district were found to be charging 900 yuan ($141.20) as a starting price to people desperately needing a ride. told to stay out of the way," a man who volunteered to help and requiring anonymity told the Global Times. had been abandoned by their owners, the Xinhua News Agency reported. expressway, as vehicles in long queues were stuck in knee-high water. "humane" approach when handling such emergencies. "More flexible measures should be adopted in those cases," Xia said.